The Bay of Plenty is one of THE places to visit in New Zealand courtesy of its beaches and moderate climate. 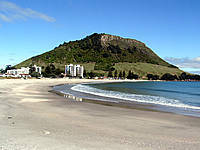 The main cities in the Bay of Plenty are the tourist mecca of Rotorua and the major port of Tauranga and its satellite towns Mount Maunganui and Papamoa. Rotorua is New Zealand's most active thermal region and the city has built its reputation on providing excellent services for visitors, its natural beauty and adventure activities. Tauranga and its surrounds - only 45 minutes from Rotorua - offer visitors just about everything they could want. Cafes and restaurants are high quality, accommodation plentiful and outdoor activities abound. And don't forget to check out Cafe Versailles - a fabulous restaurant in nearby Grey St. You won't get better French food anywhere. Across the harbour bridge from Tauranga is Mount Maunganui, or the Mount, where you can take a walk up to the 232-metre-high summit of Mauao for spectacular sea views, or around the base for more gentle exercise. Afterwards there are terrific hotpools to relax in. From the top of the Mount you can see to the Coromandel Peninsula or down the coast to Papamoa and the Maketu Peninsula. In the hinterland from Papamoa are the impressive Kaiate Falls - just perfect for summer picnics and swimming. On the eastern border of the Bay of Plenty are the Kaimai Ranges (Kaimais) and on the foothills there is a wonderful spot to relax in relative tranquility. It is the McLaren Falls a series of small waterfalls and rock pools that stretch away into the distance. North of Tauranga are the Katikati Bird Gardens where you can take time out to stroll among hundreds of varieties of birds. To the east is the town of Whakatane where you can enjoy trips with Dolphin Seafaris to swim with dolphins or take an adventure and head out to the active White Island volcano by either boat or helicopter. You can also head inland from Whakatane and check out the Tarawera Falls near Kawerau.